Master & Dynamic has made some Leica-styled special edition headphones | What Hi-Fi? 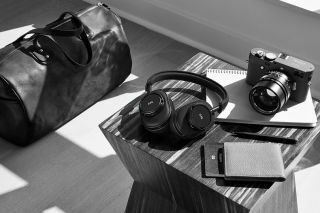 The Master & Dynamic 0.95 Signature Collection comprises two headphones, an earphone, and a headphone stand, all styled after Leica's iconic cameras. Master & Dynamic has teamed up with camera manufacturer Leica to make some special edition headphones. All products in the 0.95 Signature Collection feature design flourishes borrowed from Leica's iconic cameras, including the red marker from the firm's lenses. The headphones included are the MW60 Wireless Over-Ear Headphones (£500), MH40 Over-Ear Headphones (£370) and the ME05 Earphones (£180). Also in the range is a stand, the MP1000 Headphone Stand (£50). Both headphones are covered in black smooth grain cowhide, and feature the legend "Developed in NYC. Reimagined in Wetzlar" engraved inside the ear cup. As camera enthusiasts will have already noted, the range is named in homage to the Leica Noctilux-M 50mm f/0.95 ASPH lens. "I've loved Leica's aesthetic and craftsmanship for quite some time, so to be partnering with them on a design project within three years of the launch of Master & Dynamic is truly an honour," said Jonathan Levine, Master & Dynamic's founder and CEO. "It's amazing to see how many fans and enthusiasts we have in common." The range is available from 11th May from participating Leica stores, Master & Dynamic's website and other select key retail partners. Check out the accompanying video below.